Ground floor: Dining room/kitchen. 3 bedrooms: 1 double, 2 twin, each with en-suite shower room with toilet. First floor: Living room. 3 bedrooms: 1 double (5ft four poster), 4 steps up to en-suite bathroom with spa bath and toilet (shared by adjoining door). 3 steps down to 1 double bedroom. 1 double (5ft) bedroom with en-suite shower room with toilet. Multifuel burner in living room (no fuel provided).Oil central heating, oil, bed linen and towels included. Elec by meter reading. Cot. Travel cot. Two High-chairs. TV. Video. CD. Elec range. Microwave. Washing machine. Tumble dryer. Dish washer. Fridge/Freezer. Enclosed garden with patio and furniture. Barbeque. Hot tub . Shared indoor swimming pool (5m x 12m, depth 1m). Jacuzzi and sauna available to guests mornings and afternoons at selected hours. Ample parking. Holidays run from Friday to Friday. For a better idea of where Berwyn Bank is, you can see Berwyn Bank on the map below. Berwyn Bank is in Cumbria; should you be on the lookout for a special offer, you can find all the special offers in Cumbria. It's always worth checking to see what is on offer at the moment. 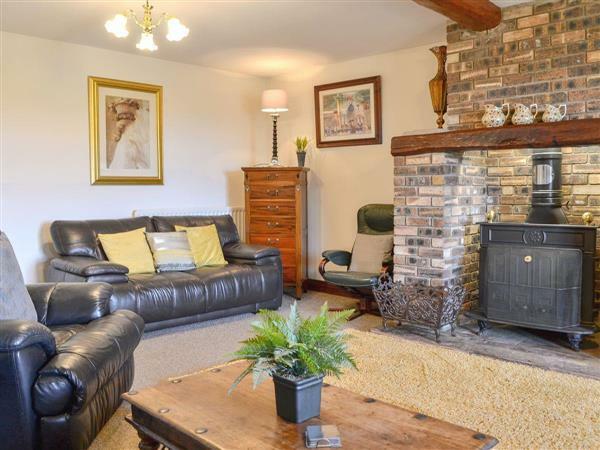 Do you want to holiday near Berwyn Bank (15825), you can see other cottages within 25 miles of Berwyn Bank; have a look to find your perfect holiday location.